Third Division, of operations November 22-29 and December 15-16, 1864. Columbia, Tenn., December 29, 1864. On the morning of the 22d of November, in accordance with orders received from headquarters Army of the Ohio, I moved the division from Pulaski to Lynnville, and, in view of the report that the enemy were in force at Lawrenceburg, placed Reilly's brigade upon commanding ground on the west of the village and of Lynn Branch, covering the Lawrenceburg road. Henderson's and Casement's brigades were placed north of the village, also on the west side of the turnpike. Wagner's division, of the Fourth Corps, which followed my command and reported to me by order of the major-general commanding, I put in position on the south and southwest of the place, the whole force forming a semicircle, resting upon the turnpike north and south of the village, and all the roads being held by outposts and chains of vedettes. Nothing was seen of the enemy except that on the morning of the 23d a reconnoitering party of cavalry approached on the Lawrenceburg road and captured two men of Reilly's brigade, who were, without authority, beyond the pickets. The commanding general arrived in person about noon of the 23d, and I received orders to move my division toward Columbia about ten miles, so as to cover the crossing of the Columbia pike by the Mount Pleasant and Shelbyville road. The division was immediately put in motion and reached the point designated at dusk and went into camp. Casement's brigade being in advance was put in position with its right resting upon commanding ground near the junction of the roads, and Henderson's and Reilly's brigades being respectively on the left. Nothing was seen of the enemy, though reports were received that they were in force at Mount Pleasant, nine miles distant, and moving toward Columbia. November 24, at 4 a.m., received orders to move at once with my division to Columbia, and to cover that place during the concentration of the army there, the enemy being reported to be pushing our cavalry rapidly back on the Mount Pleasant and Columbia pike. The division was immediately put in motion, Reilly's brigade in advance, followed by Henderson's, and Casement's brigade bringing up the rear, covering the train. At a point two miles from Columbia I determined to take a cross-road intersecting the Mount Pleasant pike one mile and a half from the former town, and, marching the head of the column rapidly, reached the last-named turnpike just as the cavalry brigade, commanded by Colonel Capron, reached the same point in hasty retreat before a very superior force of the enemy's cavalry, under Forrest, who had been pressing them hard for several miles. This was at 7 a.m. l ordered Reilly's brigade into position on the right (west) of the turnpike, throwing forward the One hundredth Ohio Volunteers to the bank of Bigby Creek (a small stream crossing the road at that place, and at the time not easily fordable), to support a strong line of skirmishers and check the enemy's advance during the formation of the division. Henderson's brigade was put in position on the left of the turnpike, in two lines — the first, an advanced line, at Mrs. Wilson's house, on the first plateau above Bigby Creek, and the second on the continuation of a considerable ridge farther in rear and connected with Reilly's line on the right of the road. Casement's brigade, coming up a little later, was placed on the left of Henderson's, on the ridge, an excellent position, stretching nearly to the Pulaski pike (see topographical sketch accompanying).1 The batteries of the command, under Capt. G. J. Cockerill, acting chief of artillery, were posted as follows: Cockerill's battery (Battery D, First Ohio Light Artillery on the right of the Mount Pleasant pike and at the left of Reilly's brigade, Wilber's battery (Twenty-third Indiana Battery) on a knoll between Henderson's and Casement's brigades, and Harvey's battery (the Fifteenth Indiana Battery) at the left of Casement's line. The enemy pushed in vigorously, and a lively skirmish ensued, which continued most of the forenoon, but they did not succeed in crossing Bigby Creek. Capron's cavalry, by my order, rallied at the rear and then took position upon Reilly's right, covering that flank of the whole line. About 10 a.m. the head of column of the Fourth Corps reached Columbia, and they began to go into position upon the left of this division, Whitaker's brigade of that corps relieving Casement's, which was brought down to the right till its right flank rested on the Mount Pleasant pike, relieving in its turn the second line of Henderson's, which was advanced to the support of the first line of that brigade, thus giving stronger reserves upon the turnpike, which seemed to be the principal line of the enemy's operations. Harvey's battery (Fifteenth Indiana) was brought over to the right and placed, one section near the center and the other at the right of Reilly's brigade. The One hundredth Ohio Volunteer Infantry was relieved from its position in support of the skirmish line at Bigby Creek by the Sixty-fifth Illinois Volunteers, of Casement's brigade. Toward evening portions of the Second Division of this corps came into position on the right of Reilly's brigade, and the cavalry was withdrawn. 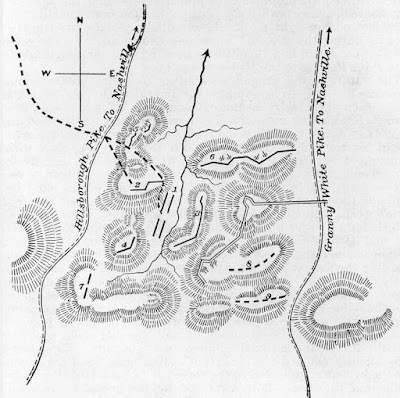 On the following morning (the 25th) no force of the enemy was visible in our front, but a reconnaissance sent forward on the Mount Pleasant pike at about four miles from the town met their cavalry again advancing, and supported by heavy columns of infantry, which proved to be the main body of Hood's army. Our whole line was strengthened by a good breast-work of timber and earth, with abatis and other impediments to an attack. The bridges over the Bigby Creek were taken up, but that stream was rapidly falling and was already fordable nearly everywhere. The enemy advanced cautiously, but with considerable determination. An advanced line of our skirmishers beyond the creek were driven back at the pike, though they were still kept out on the right, where the creek approaches nearer to our line of breast-works. Several batteries were put in position opposite us, and under cover of the artillery fire an attempt was made to advance along the turnpike, which, however, was easily repulsed. The Sixty-fifth Illinois Volunteers, in support of the skirmish line, had erected a barricade of rails near the creek, but upon the enemy turning the fire of his artillery upon them the regiment was withdrawn into a slight hollow in rear of their left, leaving a heavy skirmish line in their barricade. The enemy's cannonade was returned from our batteries, which at an early hour in the afternoon silenced those of the rebels and caused them to withdraw both their artillery and the infantry supports out of range. The skirmish fire along the creek was continued until dark. Our losses were trifling, amounting to casualties in all, for the particulars of which reference is made to the lists forwarded herewith. At evening I received orders from the major-general commanding to remove two brigades and the artillery of my command during the night to the north bank of the Duck River, and to take position covering the ford (where the pontoon then was), one brigade, with the whole skirmish line, to remain in the present position, whilst the remainder of the army should take up an inner and shorter line within the town. This movement to be made after the Fourth Corps should have gotten into position on the new line. I accordingly ordered Henderson's brigade to remain in support of the skirmish line and the remainder of the command to be in readiness for the proposed movement during the night. At 12.30, notice being received that the Fourth Corps was in position and the road clear, the brigades of General Reilly and Colonel Casement, with the batteries and baggage train, were put in motion and passed over the river by the pontoon bridge, which was then removed to a point two miles farther down the stream and in rear of the new line occupied in and at the right of the town. The weather, which had been clear since leaving Pulaski, now changed to rain. At daybreak of the 26th I rapidly reconnoitered the ground on the north of the river, and found that the ford is situated at the extreme southern point of a bend of the river, inclosing a long narrow tongue of land, which is almost everywhere commanded by the hills and bluffs on the southern bank, one of the most commanding of which is crowned by a stone fort, at that time within the line occupied by our troops. The southern point of the tongue of land is entirely bare of trees or other cover, and is from fifteen to twenty feet lower than the banks immediately opposite, the river being here not quite 200 feet wide. A little farther north the ground rises slightly, till, at a distance of from 600 to 800 yards from the ford, a ridge traverses the bend, crossing it in a curved line, which is about as high as the hills on the opposite side, except a range of two or three, including that upon which the fort is situated. Upon this ridge is situated the house of Mrs. Brown (see topographical sketch).1 In rear of the ridge the ground is again depressed, and the whole distance across the tongue is in plain view of and commanded by the ground on the opposite banks of the river. Still farther to the rear, and about a mile distant from the ridge last described, is another ridge or chain of hills nearly at right angles to the Franklin pike and affording a good defensible position. The house of Mrs. Porter is upon this ridge (see sketch)1 Rutherford's Creek, a deep, difficult stream, crosses the Franklin pike two miles from Mrs. Porter's, and by a circuitous course runs into the Duck River about a mile below the ford. The examination of the ground showing that the only tenable position in the bend of the river was the ridge on which Mrs. Brown's house is situated, I ordered Reilly's brigade to occupy that ridge from Mrs. Brown's to the turnpike, and Casement's on the left of the turnpike. Wilber's battery was put in position in the center of Reilly's position, and the other two batteries left in reserve at Casement's position, epaulements being constructed to cover them, facing both east and south, on Casement's line as well as upon Reilly's. The troops were ordered to intrench themselves, and rifle-pits for a strong skirmish line were dug along the margin of the river, taking especial pains to make as much cover for sharpshooters as possible opposite the ford. The Eighth Tennessee Volunteers, of Reilly's brigade (a small regiment numbering less than 200 men), was placed as a reserve for the skirmishers in a small depression a little in rear of the ford, where their flanks were covered by the nature of the ground and their front by a breast-work. During the 26th these preparations were continued without interruption, the skirmish lines not being withdrawn from the old positions on the south of the river. An attack was made upon Colonel Henderson's line, upon the Mount Pleasant pike, but was repulsed and the original lines maintained until night of the next day, 27th, when the whole command was moved by the major-general commanding to the north side of the river. At daybreak of the 28th the enemy occupied the town, and immediately lined the banks of the river with skirmishers and sharpshooters and opened a lively fire. They also placed several batteries in position and opened fire upon our lines. In addition to the earth-works above mentioned I had on the day before caused good cover for a battery to be made on the farm road leading from Mrs. Brown's to the ford, and also immediately in front of Mrs. Brown's house. In the first of these I placed one section of Harvey's battery, and the other section of the same battery was put in the work at Mrs. Brown's. Our skirmishers, having the advantage of rifle-pits previously prepared, found no difficulty during this day in maintaining their ground, though the cross and plunging fire upon them made their position a trying one. In artillery practice the rifled guns of Cockerill's and Harvey's batteries proved more than a match for the rebel guns, which seemed mostly light 12-pounder smooth guns, and none of the enemy's batteries were able to maintain a position, though they shifted their ground and kept up a fire at intervals throughout the day. During the morning the Fourth Corps took position on the ridge at my rear (on which Mrs. Porter's house is). and the two wings of that command reaching the river, right and left, covered the flanks of this division, and prevented the enemy from annoying me by a flank fire. Soon after noon Henderson's brigade reported (Col. I. N. Stiles temporarily in command, on account of sickness of Colonel Henderson), and was placed on the right of Reilly's, beyond Mrs. Brown's house, and somewhat recurred, so that the whole division was now formed in a crescent upon the ridge before described. Early in the morning of the 29th I was notified by the major-general commanding that the report that the enemy was crossing Duck River in force several miles above, made it necessary to withdraw most of the Fourth Corps from its position, and I received orders to hold the bend of the river and prevent the rebels from crossing or laying a pontoon bridge till evening. The enemy had used the night in making rifle-pits and other shelter for troops along the river-bank, and succeeded in getting a battery in position where it enfiladed the line of rifle-pits for our skirmishers near the ford and old bridge-head, making it impossible for the men to remain in them or in the open ground at the extreme point of the tongue of land in the bend. I thereupon ordered Brigadier-General Reilly, commanding First Brigade, to establish a new line as far forward as it was possible to obtain cover, and give it such supports as to prevent any enemy from forming above the bank of the river, still keeping the men in the old positions on the right and left, where they could command the approaches to the river on the opposite side. He accordingly ordered the Twelfth and Sixteenth Kentucky Volunteers to occupy the open timber down to the edge of the cleared ground, in irregular open order, using the trees for shelter. These regiments occupied this position through the day, and by a well-directed fire foiled all efforts of the enemy to bring down to the river or launch pontoons until late in the afternoons. A brisk cannonade was kept up on both sides at intervals during the day, the enemy striving to establish batteries sufficiently far up and down the river to take our positions in reverse, but were foiled by the very active use made of his guns by Captain Cockerill, chief of artillery, and the superior practice of our gunners. The enemy in the town (since learned to be Lee's corps, with the whole artillery park of Hood's army) made redoubled efforts to force a crossing as the afternoon advanced, and about 4 o'clock succeeded in getting several pontoon boats down to the water. With these, sheltered by the steep banks of the river and covered by a heavy fire of both artillery and musketry, they ferried over a considerable force, which made an effort to form and charge into the open wood where the two Kentucky regiments were posted. As soon, however, as they showed themselves on the open ground they were met with a severe and galling fire, which soon drove them for shelter under the river-bank. Colonel Stiles promptly moved forward the Sixty-third Indiana and the One hundred and twelfth Illinois, of his brigade, to support the right of those advanced regiments, and the enemy finding it impossible to clear the wood by his fire from the south bank, so as to enable his detachment to reform, withdrew them, and made no further effort to cross whilst we remained in the position. Owing to the advantage taken of every natural and artificial means of shelter for the men, the casualties in the division did not reach 100, although the command was during the whole day under severe concentric fire from all parts of the enemy's line, which was semicircular and exterior to ours. For details of the casualties reference is made to the lists forwarded herewith. From reports of prisoners I am satisfied the enemy's loss was very much greater than our own. One of the brass guns of Wilber's battery was struck by a solid shot near the trunnion and disabled. No other accident occurred to the artillery. At dark I received orders to move the division to Spring Hill, leaving the skirmish line with proper supports out until midnight, when it should follow the command. The Twelfth and Sixteenth Kentucky regiments were accordingly left as they were, supporting the skirmishers. Major Dow, assistant inspector-general on my staff, together with the brigade inspectors, being also left to direct the rallying and bringing off of the detachments, and the remainder of the command marched at 7 o'clock for Spring Hill passing the First and Third Divisions of the Fourth Corps on the road. At Spring Hill I received orders to proceed in advance of the army to Franklin without delay, and marched forward, reaching Franklin an hour before dawn on the 30th, having marched over twenty miles since 7 o'clock of the evening preceding. I have omitted to mention that one regiment of Casement's brigade, One hundred and twenty-fourth Indiana Volunteers, was, on the 28th, detached as an outpost at Rutherford's Creek, on the Franklin pike, and on the 29th was doing picket duty on roads coming into that pike between the creek and Spring Hill. One company, by order of the major-general commanding, reported to Brigadier-General Ruger, commanding Second Division, Twenty-third Corps, for similar duty. The remainder of the regiment reported to the brigade again as we marched to Spring Hill, but the one company has not since been heard from, and is supposed to have been captured from some misunderstanding as to relieving it. The pickets left at Duck River remained till midnight and were then safely withdrawn, except Lieutenant Sherbondy and ten men of the One hundred and twelfth Illinois Volunteers, who are missing and are supposed to have lost their way in the wood on the extreme right, where they were posted. The march from Duck River to Franklin was made in the most perfect order; the men, knowing they were moving near the enemy's positions, kept well closed up, and I cannot learn that any were lost by straggling or falling out on the road. The roll-calls at Franklin next morning showed the whole command accounted for, except those referred to above. Besides expressing my high sense of the services performed by the commandants of brigades during the very trying day and night of the 29th, I beg leave to make special mention of Capt. Giles J. Cockerill, Battery D, First Ohio Light Artillery, my chief of artillery, and of Maj. Tris. T. Dow, One hundred and twelfth Illinois Volunteers, acting assistant inspector-general of the division--the former for his brilliant handling of the batteries of the command during the day and the latter for his admirable performance of the delicate duty in charge of the skirmish line, left on duty and withdrawn at midnight, several hours after the rest of the command had marched. Maj. J. A. CAMPBELL, Asst. Adjt. Gen., Army of the Ohio. Columbia, Tenn., December 25, 1864. On the evening of the 14th I received orders to withdraw the division before daylight next morning from the line of works crossing the Franklin turnpike in front of Nashville, including Fort Negley and the fortified hill at Block-House Casino, and upon their place being supplied by troops of Major-General Steedman's command, to march to the Hillsborough pike and form as a support to the Fourth Corps, Brigadier-General Wood commanding. My picket-line was ordered to be left in position until relieved by General Steedman. Accordingly, at 5.30 a.m. on the 16th [15th], I withdrew the command from the works, massing them behind the hill slopes in rear from 100 to 200 yards. The picket-line was left under command of Major Baker, Sixty-fifth Indiana Volunteers, division field officer of the day. At 7 a.m. the line was partially occupied by General Cruft's division, of General Steedman's command, and the First Brigade, Col. C. C. Doolittle, Eighteenth Michigan Volunteers, temporarily commanding, with the Third Brigade, Col. I. N. Stiles, Sixty-third Indiana Volunteers, temporarily commanding, and Battery D, First Ohio Light Artillery, were marched to the Hillsborough pike. A lively demonstration along the left, leading to a rapid artillery firing from the right of the enemy's line, with some appearance of an advance on their part, led me to order the Second Brigade, Col. J. S. Casement, One hundred and third Ohio Volunteers, commanding, to remain temporarily in support of General Cruft's line, which was very light. This fact was reported to the major-general commanding, who approved the order and farther ordered the Twenty-third Indiana Battery to remain at Casino Block-House, which was done. The two brigades and battery were moved to the Hillsborough pike under cover of a fog, which concealed the movement from the enemy, and were formed one brigade on each side of the road in column of battalions massed, the battery on the road in rear. In this formation the command was gradually advanced as the Fourth Corps advanced, until about 1 p.m., when I received orders from the commanding general to bring up Casement's brigade and move the division, by the rear of General A. J. Smith's command, to the extreme right of the forces engaged with the enemy. The command was moved by the flank, Colonel Doolittle's brigade in advance, by a country road leading diagonally from the Hillsborough toward the Hardin pike, about two miles, thence curving more to the left as the right wing of the army swung forward, about two miles farther, till we reached and crossed the Hillsborough pike again at a point about five miles and a half distant from Nashville, and near where the turnpike enters the high range of hills connected with the Brentwood Heights. During the last mile of the march the brigades moved in parallel lines, the right flanks being equally advanced, and the artillery on the right rear of the division, so that by fronting each brigade a column of brigades would be formed, and that we might be in hand to support the lines engaged close in rear of which we were moving. After crossing the Hillsborough pike, facing eastwardly, and passing the first range of hills, we came up in rear of General Couch's (Second) division, of this corps, who, with the dismounted cavalry, was engaged with the enemy upon a somewhat low, round-topped hill, one of two overlooking the Granny White pike, and immediately north of a high conical hill held by the left flank of the enemy's forces. I here received orders from the major-general commanding to support General Couch, and accordingly formed the First and Second Brigades (Doolittle's and Casement's) in double line each, Doolittle on the right, and advanced them into the valley in our front. Stiles' brigade (Third) was pushed to the right upon the crest of a very high rocky ridge commanding the ground beyond the right of the brigades advanced, and the battery was halted upon the hill last crossed. At about 4 p.m. General Couch reported a considerable force of the enemy passing toward his right and threatening the flank of Mehringer's brigade of his division, which was detached some 600 yards from the right of the line. I immediately advanced Doolittle's brigade to the right and Casement's to the left of Mehringer's command, swinging the right forward to occupy a subordinate ridge in the angle of high hills (see sketch accompanying) skirting our right flank. A sharp attack was here made by the enemy, which was repulsed, the fighting, however, lasting until dark. Soon after dark General Couch withdrew Mehringer's brigade from the position referred to above, and deeming it very important to hold the line occupied, I ordered the two brigades to be deployed in single line and to throw up breast-works along the ridge they held, which formed a crochet, advanced nearly at right angles to the line of Couch's division, threatening the enemy's flank and facilitating further movements by the right around the connected chain of hills, of which Stiles' brigade occupied the first prominent one. Stiles was also ordered to intrench the hill held by him, and owing to the valley (a very soft cornfield intersected by a brook) being impassable for artillery, the battery was put in position on the continuation to the left of the ridge occupied by Stiles' brigade. The positions were inspected and approved by the major-general commanding, and I received orders to be prepared for offensive movements at daylight. At about 3 a.m. of the 16th I received notice from General Couch that in closing up his lines to the left a gap of some 300 yards was opened between his position and mine at the base of the hill last carried on the evening previous. At the same time I received a dispatch from the major-general commanding stating that a division from General A. J. Smith's command would report before daylight to support me. I therefore ordered one regiment (Sixty-fifth [Sixty-third?] Indiana) of Stiles brigade to be withdrawn from the position occupied by that brigade and put in on the right of General Couch, connecting with and extending the line of the Second Division, intrenching there, and leaving whatever gap might remain in the low ground at the angle of the two lines. This was done before daylight. At 6 a.m. Colonel Moore reported with five regiments and a battery of the Seventeenth Corps, numbering in all about 1,600 men. I directed three regiments to relieve Stiles' brigade in the works constructed by them during the night, and the remaining two, with the artillery, to be held in reserve on the ridge farther to the left, where my own battery had been left. I then ordered Colonel Stiles to push his brigade forward and occupy the next of the series of hills beyond our right and intrench the commanding ground upon it, from which he could, in some measure, protect the right of Colonel Doolittle's brigade (which was refused) from assault on that flank. The enemy had been heard chopping during the whole night along the high conical hill in the re-entrant of our line and upon the ridges farther toward our right. At daylight the line of their works was apparent upon ground very considerably higher than that of Casement's and Doolittle's brigades, and early in the morning General Couch notified me that a heavy column of the enemy was passing partially in view across his front toward our right. 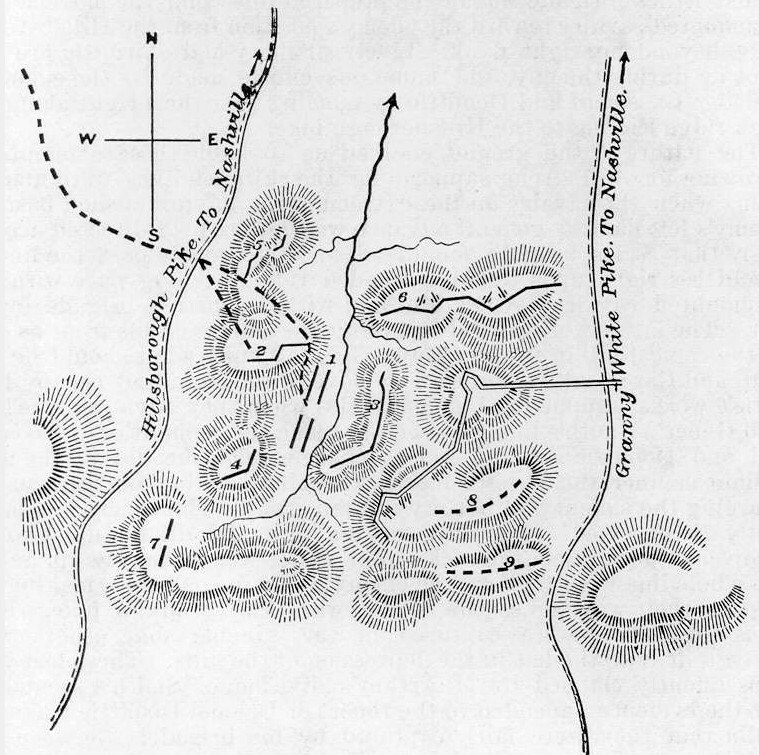 The major-general commanding, who was on the ground when the information arrived, ordered that part of my line to be held tenaciously, whilst Stiles' brigade should be prepared to second the movement of dismounted cavalry toward the enemy's position from the Hillsborough pike, beyond my right flank. Lively artillery and skirmish fire was kept up during the day, and numerous efforts made by the enemy to dislodge Casement and Doolittle by pushing past their right along the high ridge leading to the Hillsborough pike. The nature of the ground enabled us to baffle these attempts by throwing forward strong supports for the skirmish lines until about 4 p.m., when the cavalry on the extreme right having pushed past the enemy's left flank a general advance was ordered. I directed accordingly that Stiles' brigade should advance vigorously past the line of Doolittle's right upon the high wooded ridge, keeping pace with the dismounted cavalry beyond him and with Doolittle's brigade on his left. The latter was ordered to assault the salient on his front as soon as the conical hill in front of Major-General Smith's left should be carried, and Casement was ordered to move to the right and occupy Doo-little's works, supporting him and Stiles when they advanced. About 4.30 General Smith's line was seen to reach the summit of the conical hill, and Doolittle was ordered to charge. This he did in the most gallant manner, the Twelfth Kentucky Volunteers having the lead and charging the salient and battery in their front. The enemy was manifestly disconcerted. 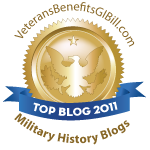 Their fire was too high, and did no injury to our troops as they scaled the rocky hill. Stiles was promptly up, and as the whole line went forward the enemy broke in confusion, making the best of their way across the hills toward the Franklin pike. Four guns (light 12's) were captured in the salient; four others were taken a little to the left in the depression of the hills. These last were subsequently claimed by McArthur's division, of Smith's command, but the evidence appended to the report of Colonel Doolittle leaves no doubt that they were fairly captured by his brigade. Between 200 and 300 prisoners were also taken. The line of our advance being perpendicular to the Granny White pike, and Major-General Smith's being along and parallel to it, we met his troops at the pike, and to avoid confusion I ordered the division to halt. The major-general commanding coming up immediately directed us to bivouac for the night, as the roads were occupied by other columns moving in pursuit. Doolittle's brigade remained on the ridge it had carried, overlooking the Granny White pike; Stiles was in bivouac on the next slope to the right, and Casement in reserve in the works erected by Doolittle's brigade on the preceding right. Showing Operations Of The Evening Of The 15th And Of The 16th December, 1864. Double lines show position of Rebel Forces. Single lines those of the U.S. Forces. No. 1.—Position of Casement's and Doolittle's Brigades, first deployed evening of 15th. No. 2.—Is first position taken up by Stiles' Brigade. No. 3.—Position of Casement and Doolittle intrenched on night of 15th. No. 4.—Is second position taken up by Stiles on morning of 16th. No. 5.—Is position taken by Col. Moore with detachment of 17th Corps, besides occupying Stiles' first line, and also of Cockerill's Battery "D," 1st Ohio. No. 6.—Is position of Couch's Division, 23d Corps, and of one regiment of Stiles' Brigade. No. 7.—Position of Cavalry advancing dismounted on 16th. Nos. 8 and 9.—Position of Doolittle's and Stiles' Brigades on night of 16th. The dotted line shows the line of advance on the afternoon of the 15th. Nashville, Tenn., December 2, 1864.
at Franklin, Tenn., November 30, 1864. Assistant Adjutant-General, Army of the Ohio. Nashville, Tenn., December 3, 1864. GENERAL: I have the honor of calling to your notice the conspicuous gallantry and meritorious conduct of Col. Emerson Opdycke, commanding a brigade in General Wagner's division, Fourth Corps, in the battle of the 30th ultimo. In the early part of the engagement a portion of the Second Division, Twenty-third Corps, was somewhat disordered by misunderstanding the purpose of retiring through the lines of the two brigades of Wagner's division, which had been engaged in advance. It was at this time that Opdycke's brigade was lying in reserve on the Columbia pike, and being called upon, he led them forward in the most brilliant manner, charging the advancing rebels and restoring the continuity of our lines, which were not again disordered in the slightest degree. Colonel Opdycke's promptness and courage deserve official notice, and as I was commanding the line at that time I deem it my duty to bring the facts to your attention, the more especially as he does not belong to my division. MAJOR: I have reports of twenty battle-flags and standards captured from the rebels by my division during the fight of the 30th, and am confident, after investigation, that the number is accurately stated. I have only eleven, however, to send to headquarters. These are now in General Reilly's possession, and will be forwarded this morning. The men have a passion for tearing them into bits to send home as relics, and in spite of orders have thus destroyed nine. I cannot give any satisfactory approximation as to the prisoners taken; all that I saw came in on the left of the Columbia pike, where my division was posted; but I am unwilling to make any claim to definite numbers, nor do I think it important that I should do so. I ordered all prisoners turned over to the provost-guards of either corps indiscriminately, and those officers can best report how many they have. 1 See Plate CV, Map 4 of the Atlas. 2 Casualties embodied in table, p. 100.